Size:. 36" X 8" X 5"
This rack made from pine wood with paint surface,look like smoothly.the wooden wine rack can holding 6 bottles wine. 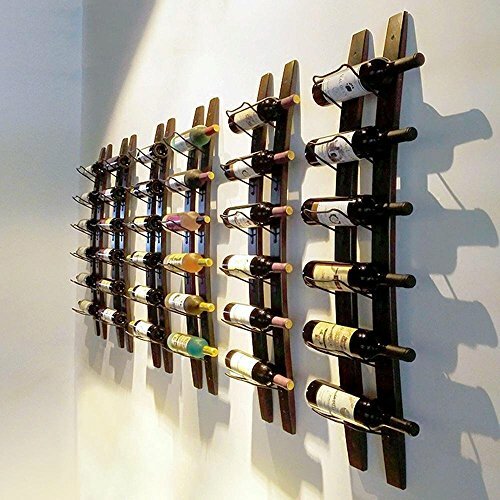 36" X 8" X 5"
Add rustic charm to your wall with our Wine Barrel Stave Rack. Artfully designed with two wide long staves and hand sanded and painted. creating a charming authentic and rustic look. Stained and finished using non-toxic (no polyurethane, glycol and zero VOC pigments) and environmentally friendly wood stain. Sealed with a food-safe oil rub. Forged wrought iron hooks hold up to 6 bottles. Assembly Very easy.1. let the metal part link to wood part and with small screws. let the metal racks in same direction. First you need to allocate distance bottle and bottle ,you can install 5 bottle or 6 bottle as you like. 2. make holes on wall with the metal holes on the tole of racks, then use the big screws screw on the wall. that will finished. Hang 6 bottles together to create a dramatic effect. If you have any questions about this product by Linex, contact us by completing and submitting the form below. If you are looking for a specif part number, please include it with your message. By Paso Barrel & Bottle Co.